Fernandes (front, left) shakes hands with Tran (front, right) after the memorandum signing witnessed by Vietnamese Deputy Prime Minister Vu Duc Dam (back, second right) and Vietnamese Deputy Minister of Culture, Sports and Tourism Le Quang Tung (back, second left), flanked by the vice chairmen of the Vietnamese Advisory Council to the Prime Minister on Administrative Procedures Reform, VinaCapital Group co-founder and chief executive officer Don Lam (left) and FPT Corporation co-founder, Chairman and CEO Truong Gia Binh (right), who is also chairman of Vietnam’s Private Sector Development Committee. KUCHING: AirAsia has signed a Memorandum of Cooperation in Hanoi, reaffirming its intention to set up a low-cost carrier in Vietnam with local partners. 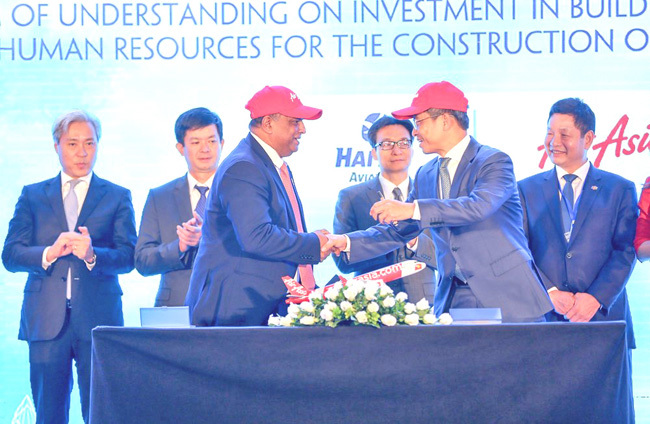 The memorandum was signed by AirAsia Group CEO Tony Fernandes and Vietnamese businessman Tran Trong Kien, in his capacity as CEO of Thien Minh Travel Joint Stock Company (TMG) and general director of Hai Au Aviation Joint Stock Company (HAA), at the InterContinental Hanoi Landmark72 here yesterday. The signing, conducted on the sidelines of the Vietnam Travel and Tourism Summit 2018, was witnessed by Vietnamese Deputy Prime Minister Vu Duc Dam and Vietnamese Deputy Minister of Culture, Sports and Tourism Le Quang Tung. AirAsia Group chief executive officer Tony Fernandes said, “AirAsia is an Asean airline. And in Asean, Vietnam is one of the last remaining countries with a large population we’re not in. Fernandes says AirAsia is already the largest foreign airline group in Vietnam by capacity. We currently operate to five destinations here, including our most recent addition, Phu Quoc. “And we will continue to expand our network to connect Vietnam to Asean and beyond, something our local JV will be able to accelerate,” he added. AirAsia operates 141 return flights weekly on 13 routes – including six unique routes – connecting Hanoi, Ho Chi Minh City, Da Nang, Nha Trang and Phu Quoc with Kuala Lumpur, Penang and Johor Bharu in Malaysia, Bangkok and Chiang Mai in Thailand and Manila in the Philippines, and has carried 12 million passengers to and from Vietnam since entering the market in 2005. Meanwhile, TMG chief executive officer and HAA general director Tran Trong Kien said that Vietnam tourism has performed extremely well as the number of international arrivals has doubled over the last three years. “Domestic and outbound travel have also grown tremendously. The sector has contributed greatly to recent economic development and social progress,” he said.